Rock with us the best tracks of the south to the sea! 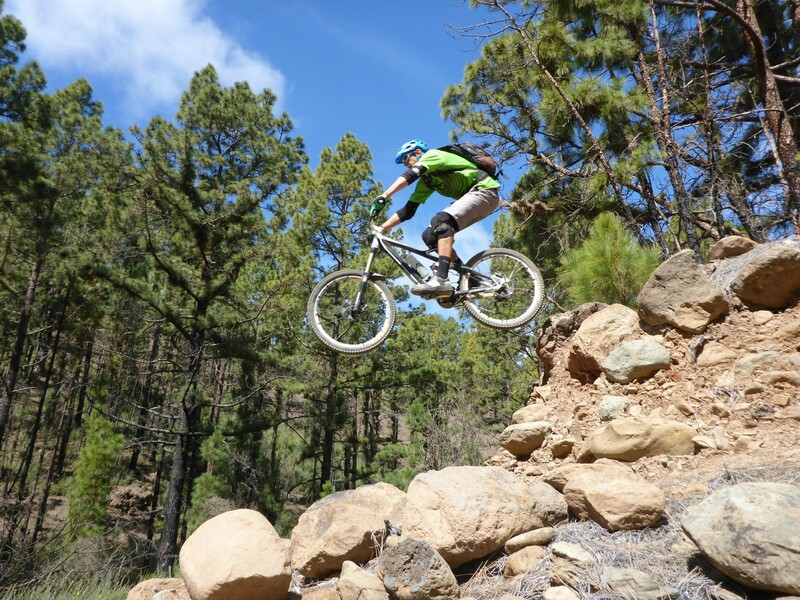 Tenerife’s singletrails are as diverse as the island itself. On no other island can you comfortably travel by bus to 2000 metres to reach the publicly unknown trails. An interesting route is just as important to us as helpful tips and tricks on bike control and technique. 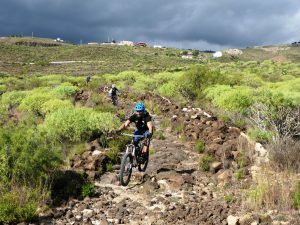 Our tours take place on technically very demanding, partly blocked and rocky trails with a steep alpine-like appearance. It is essential that for all tours the riders be in good basic physical condition and have great bike control. A maximum of 7 guests guarantee the absolute riding fun and the optimum safety. For action-packed and technically demanding downhill shuttle tours and bike riding technique training, your own DH bike and equipment must be brought along. Thanks to the organised shuttle drivers, more than 3000 meters downhill per day is usual. If you are bringing your own bike (which is recommended for a biking holiday) we ask you to be aware of the technical condition of your bike. Disc brakes with large discs are advantageous on long descends and thick, puncture resistant tires reduce the risk of annoying breakdowns due to the sharp edged volcanic rocks. On request tour bikes including helmets are available. The day tours include the pick up from the south of the island and with a maximum transfer time of less than an hour we will reach the different start points. Afterwards we usually stop in a canarian restaurant to refresh ourselves with a cool drink or “barraquito” before heading back to the hotel and even having time for a dip in the Atlantic. 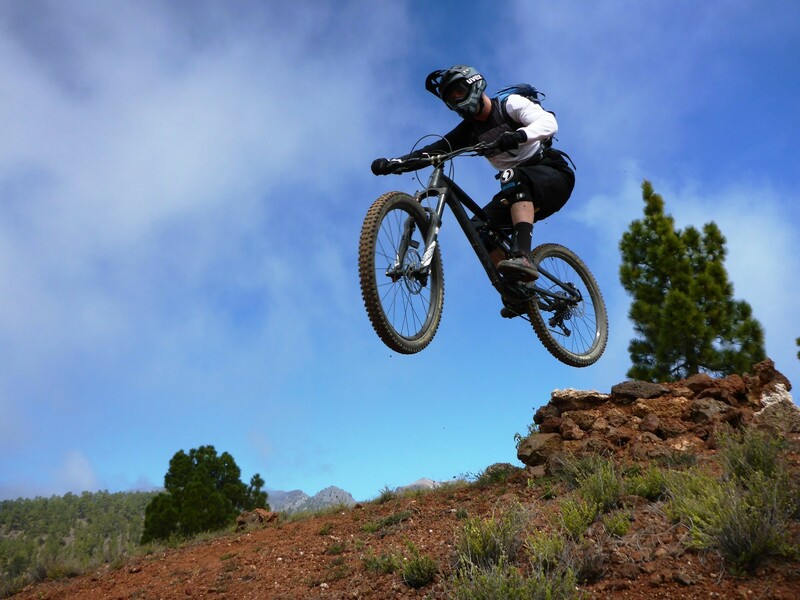 The wearing of protection (elbow- and knee pads) and helmet is mandatory and should be brought as far as possible! Due to the increased risk of danger on the singletracks in the mountains you should have a good international health insurance, which covers such sports activities. Participation on the tours is at your own risk. The organizer and bike guides cannot accept any liability or assumes no responsability for the consequences of self-inflicted accidents. The registration should be done in good time by email or telephone so that if necessary a tour bike with the correct height and/or helmet can be prearranged. Program and tour changes, due to bad weather or other unforeseen circumstances, are at the discretion of the guides and organisers. Due to the variety of our tours, send us a query with your interests and bike knowledge and we will send you a choice of tours suitable for you. Our favorite tour as “warm up” and getting to know. 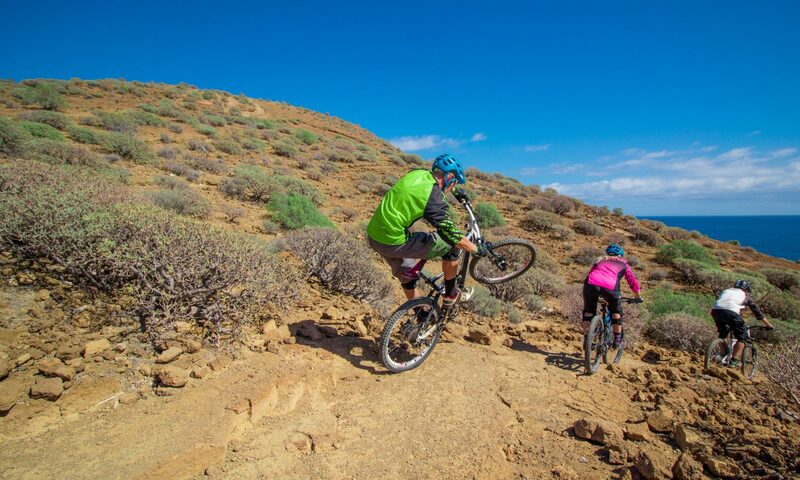 Even the locals like to start their downhills from the starting point at 2000m altitude down to the sea in the sunny south of Tenerife. In the first sections we improve our cornering skills on wide, partly eroded slopes, where you have to make the right “choice of line”. 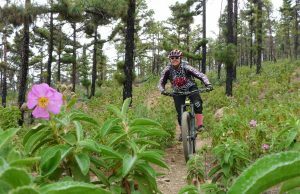 Now strengthened and focused after a picnic break it comes to 3 long and challenging singletrails like “Pipeline”, “Rockgarden” and “Eagle Pass” down to the beach of Las Americas. In total 300m uphill and 2300m downhill and 2-3 hours riding time. 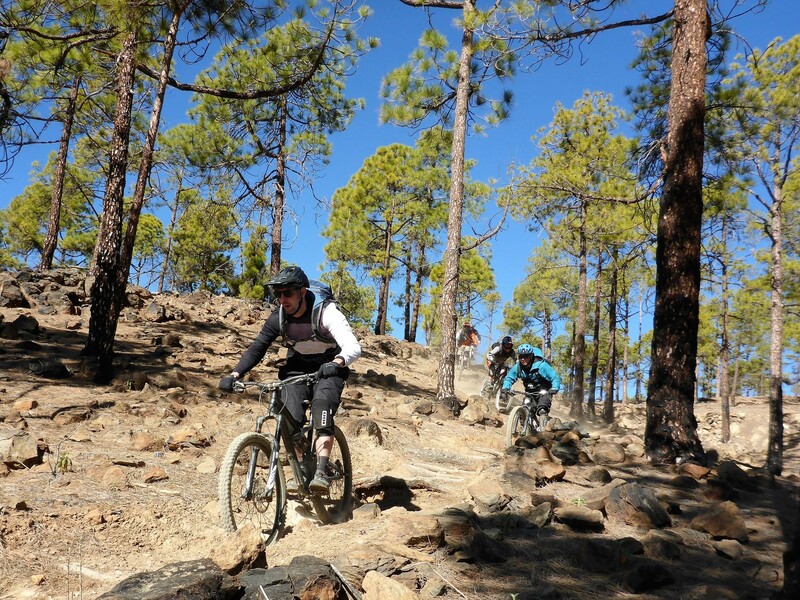 Biking on the historic pilgrim trails of the canarian natives. 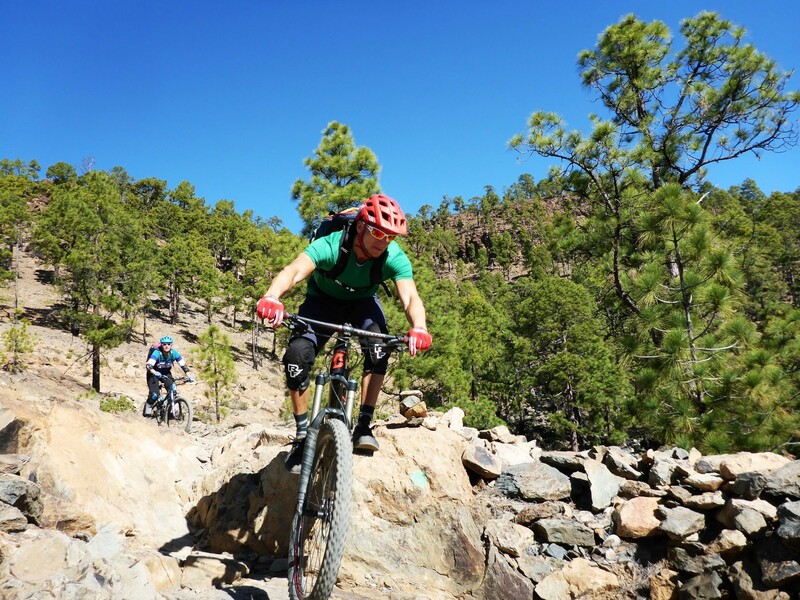 The so – called “caminos reales” consist of natural paving stones, natural stone walls, rough passages on solid rock plateaus and loose volcanic gravel and offer a lot of variety with technically difficult challenges. Riding pleasure and flow you will get on a northshore line with a wooden whip. Trails like “El Guanche”, “El Roque”, “Sentinel” and “Te Quiero” or “Aldea Blanca” will be tiring our arms and using the suspension of the bikes. In total 400m uphill and 1800m downhill. From the starting point at 1600m we cycle down to the picturesque bay of Costa del Silencio into a “Chiringuito” to enjoy the best Mojito of the island and to swim in the atlantic. 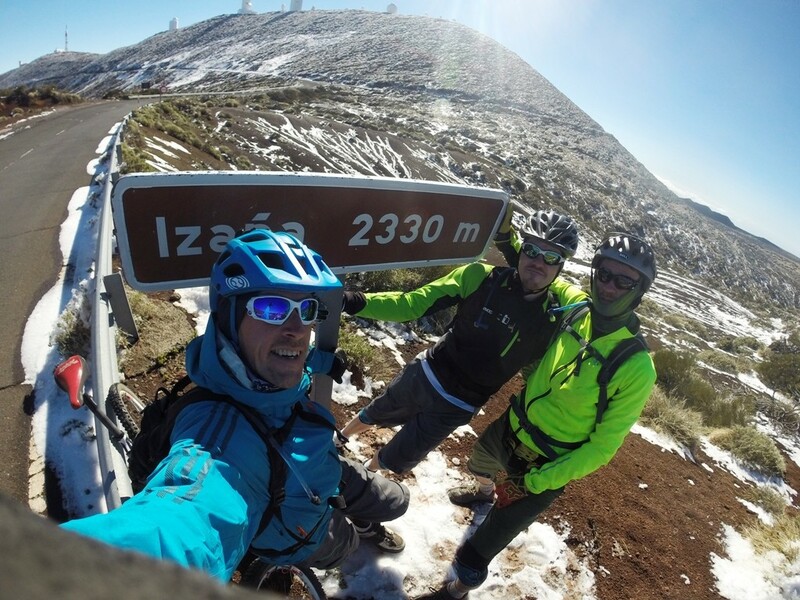 “Epic” long descent from the solar observatory on 2330m to the south. The unique scenery of the Teide National Park does the rest. From the highest possible starting point for a bike tour on Tenerife we leave the Teide behind us and cycle down to the sea. More than 2600 metre downhill and only 400 metre uphill. 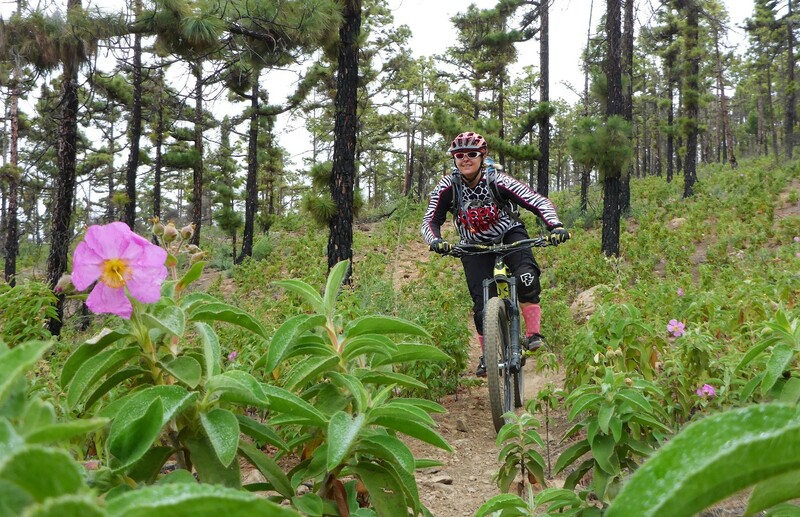 An Enduro tour with “carrying passage” through a “barranco” and varied landscape. Demanding dirt roads and the technical “Gamblertrail” are challenging our endurance and concentration. 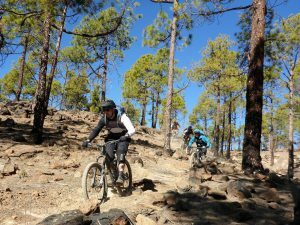 Then we ride on “Desierto” – Trails to a beach bar in surfers paradise El Medano.